Just when we thought the Great Smoky Mountains couldn’t get any better, a new building being built in the area completely changes our minds. The excitement never stops when you’re in the Smoky Mountains. Funding for the new facility was approved by the U.S. Department of Interior, so plans for the building are already underway. The building’s total cost is $4.3 million. With $2 million coming from federal funds from the National Park Service, it leaves approximately $2.3 million to fully fund the project. Thankfully, the $2.3 million has been funded through private donations! The center will sit across from the Heritage Museum in Townsend, on 1.6 acres of land donated by the Heritage Museum. The new building in the Smoky Mountains will store a variety of artifacts and archival records for the Smoky Mountain area. The building plans to store 450,000 archival records and 422,000 original historical artifacts from the national park and regions in the Smoky Mountain area. Items like clothing, weapons, logging equipment, land records and Andrew Johnson’s presidential papers will be stored in the National Park Service Joint Curatorial Collection Facility. 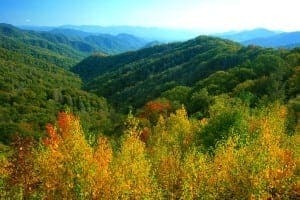 This approval is guaranteed to help out the Smokies as well as surrounding national parks. Other national parks do not have facilities that meet the National Park Service standards for safety and protection from physical and environmental hazards. Other parks that will store records and artifacts at the new building in the Smoky Mountains include Obed Wild and Scenic River, Cumberland Gap National Historic Park and the Andrew Johnson National Historic Site. Construction is set to begin sometime in summer 2014. At Aunt Bug’s Cabin Rentals, we would love to have you join us for some relaxation in the Smoky Mountains. With cabin rentals in the heart of the Great Smokies, we have a place to meet the needs of every budget. Whether you’re looking to sit and relax in a soothing hot tub, or cabins with a game room, we’ve got it all. Give us a call at (800) 953-5655 to let us know what you’re looking for, so we can set you up with the best cabin rental for your vacation.